We know a good deal about the history of the middle part of Lismore, even some details about how ordinary people lived in the 17th century, because of the many documents held in the Glenorchy/Breadalbane archive in the National Archives in Edinburgh (see “Tracing the History of Baligrundle” in the Heritage/History section of the CELM website). We know much less about the north and south ends and there are some very surprising gaps in knowledge – such as the date and circumstances of the founding of Port Ramsay, and the building and operation of the lime kilns at Park and Alastra. Detailed study of the 19th century history of the area is also important because the census records indicate that it retained its population throughout the century – in contrast to the Cheyne estate (extensive clearance) and the Baleveolan estate (decline in population after improvement in the mid-century). Because of two phases of investment by successive landowners (1810-1820, and in the 1850s and 1860s), and the Appin ferry, the North End was important in the social and economic development of Lismore. Lismore became a Campbell island in 1460 when the Stewart of Appin male line failed. 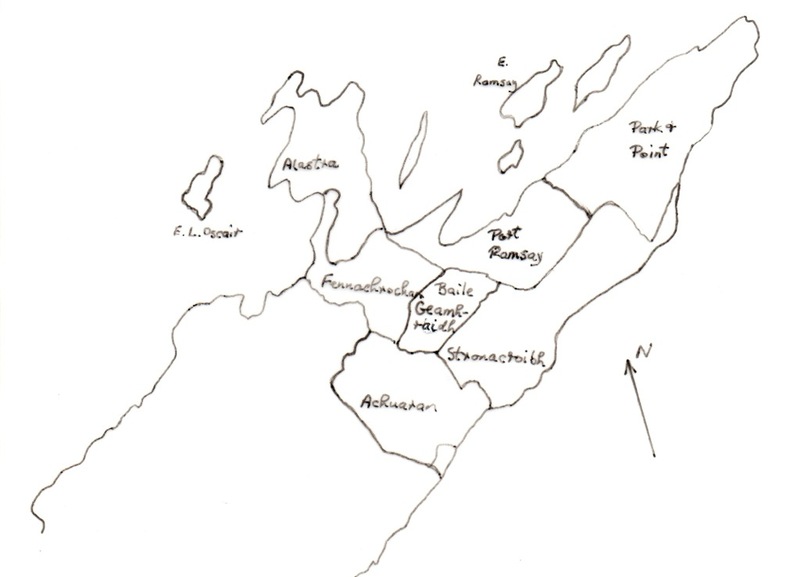 Two Colin Campbells, each married to a Stewart heiress, shared out the townships of Lismore, with the Lord of Glenorchy taking the central “slice”: Baligrundle, Achnacroish, Tirlaggan, Killean, Potrtcharron, Baleveolan, Balimakillichan and Portcastle. To the north, the 1st Earl of Argyll took possession of Balnagown, Kilandrist, Tirfuir, Baligarve, Balimenach, Achuaran and Fennachrochan (although the Stewarts appear to have retained some influence – for example in diverting Alastair MacColla from Lismore during his systematic devastation of Campbell lands in 1645). In the mid-17th century, the Earl of Argyll gave most of these northern townships to the infamous Donald Campbell of Ardnamurchan, who later gained the lands and title of Airds on the mainland. However, detailed research by Diarmid Campbell, Kilmelford, has shown that, from the early 16th century, the Earl issued separate charters for Achuaran (various spellings), split into two parts (Mòr and Beag) to cadet branches of the Campbell clan (Lerags and Inverawe). Achuaran Beag was linked with Balimenach (now Baileouchdarach can anyone confirm this?) and possession of the land carried the office of “Martyship or Sergeandry of Lismore” – the Earl’s policeman on the island. It is not clear whether this involved actual residence on Achuaran. At times, Achuaran Mòr was paired with Cloichlea (another Argyll township to the south of the island). By the mid-17th century, charters mention Achuaran “Over” but the family in possession was referred to simply as the Campbells of Achuaran, and in 1687, a charter from the Earl of Argyll referred to the 4 merk land of Achuaran. At the 1751 valuation, the owner was Dugald Campbell of Achuaran, but the land was sold to Campbell of Airds in 1774. Meanwhile, the Duke of Argyll was still in direct possession of Fennachrochan in 1751 but this was also shortly transferred to Airds. Lt Col Sir John Campbell of Airds (1767-1834) was succeeded by his son, also Sir John (1807-1853), but he was in financial difficulties in the 1840s (probably bankrupt by 1848), and a printed rental of the estate (Frackersaig, Cloichlea, Balnagown, Kilandrist, Baligarve, Balure, Tifuir, Achuaran, Fennachrochan & Port Ramsay) shows that he was looking for a buyer around 1840. He was appointed Lt Governor of St Vincent & the Grenadines in the West Indies in 1845 and died there in 1853. Meanwhile, Airds House in Appin had finally been sold in 1852 to Robert McFie, who used the resources of his sugar refining family to develop the town of Oban. The Lismore estate was, in 1866, left to their nephew, Revd Alexander Fell, son of Janet Haig, as William had already died. The Fell family retains some of the land to this day, including Achuaran and part of Fennachrochan. Today the North End has been broken up into at least six separate landholdings (taking the Port Ramsay crofts as a single unit) but records before 1800 mention only Achuaran and Fennachrochan, with traditional rents of 6 and 4 merks respectively. The 1688 Valuation Roll for Argyllshire valued Achaworan (Alexander Campbell) at £138.13.4 and Finnknochan (John Reid, absent) at £88.17.8. It will probably prove impossible to establish the original boundaries of Achuaran Mòr and Beag. Today there are four possible sites for the houses and steadings: Achuaran Farm [Cachiladrishaig in the 1855 Ordnance Survey (MacGillivray)]; Achuaran steading [Achuaran in 1855 (next to Reynolds)], Baile Geamhraidh (Tombs) and Stronacroibh. The strongest candidate must be Baile Geamhraidh (the wintertown) because elsewhere on Lismore, the wintertown, where the livestock were kept over winter, was also where the permanent buildings were sited, allowing the surrounding arable land to benefit from the accumulated manure (see the webpage “Tracing the History of Baligrundle”). The fact that the original track along the island appears to have been along the crest of the ridge passing Baile Geamhraidh supports this suggestion. William Roy’s Military Map (c1750) appears to show two clusters of buildings on Achuaran: around 5 amongst cultivation ridges to the north and well above the shore, possibly the wintertown; and a cluster of 7-10 buildings nearer the southern shore, possibly Cachiladrishaig. William Roy’s Military Map (1750) does not show any buildings on Fennachrochan. Today the name is normally used only for the crofts at Laggan but, before 1800, there was no Port Ramsay and no separate Park Farm (see Part 4). 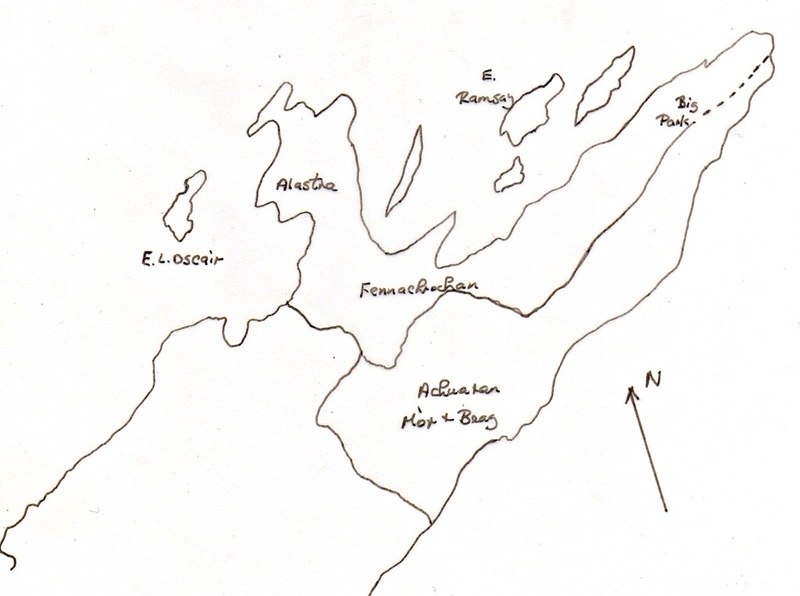 The deeds of Park refer to the farm as “the Big Park of Fennachrochan”, showing that the original township of Fennachrochan was very externsive, stretching from the peninsula of Alastra to Point. A clue to the original boundary between Achuaran and Fennachrochan (dashed line in Fig. 2) can be found in the 1766 Commission of Supply report, which refers to the Port Appin ferry as operating from Point of Achuaran. The Old Parish Records refer in 1777 to Achuaran Point; and in 1778 and 1780 to Patrick Cameron at Achuaran Ferry (see Part 5). William Roy’s map shows intensive cropping (rig and furrow) over the flatter areas of the North End but none on Park, Point or Alastra – although patches of rig and furrow can still be traced in each of these areas. It is likely that the cropped areas were in runrig until the late 18th century. Achueran, Achaworran, Achaworan, Achiyuohir, Acheuran, Auchavorrane, Auchavoreane, Achouran, Achavorren (16th & 17th C charters), Achaoura (Blaeu Atlas 1654) Achouran, Achavouran, Achaworran, Achavorean, Avichorean, Achvorean, Achueran (18th C charters) Achaghauran (Roy 1750) Auchguaran (Census 1841) Achuoran (Census 1851) Achaworan or Ahavorean (1853 estate advertisement) Achueran (1862 Admiralty chart) Achauran (OS map for 1898). The name could originally have arisen out of the words for field Achadh and spring or fountain Fuaran. There are several springs and wells on the township, including Tobar Mhuire (St Mary’s Well) on Stronacroibh – possibly a healing well dating back to the period of the Celtic Church. Finknockan (Blaeu Atlas 1654) Finnocrachan (Roy 1750) Fionchrochan (Census 1841) Finknockan (1853 estate advertisement) Fennacrochan (Oban Times advertisement 1866) Finnacrochan (OS Map for 1898). Finn or Fingal’s hillock is one of a group of “Fingalian” names in the north of the island, possibly evidence of a strong bardic tradition on the island. Campbell A. (200). A History of Clan Campbell. 1. From Origins to Flodden. Campbell, Diarmid. Inverawe Kindred a Achouran. Appendix of Entries. Unpublished document. Copy in the Lismore archive.